Your Love Keeps Lifting Me Higher | Wedding Wisdom, Etc. Quite simply, this is a classic. The bass line is the thing that grabs you first, which is fairly unique. Usually it’s a guitar groove, or a distinctive piano line, that first catches your attention. 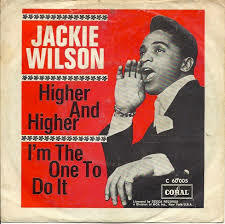 I have put this great Jackie Wilson song in four blog categories. 1. 60s & 70s: Released in 1967, it feels like classic Motown, even though it was recorded on Chess Records. The beat, starting with that forceful bass line, is completely infectious….making it a great dance tune. 2. Introduction Music: What makes this such a good song to introduce the bridal party into the reception is that same fun beat, as well as the fact that the music is very repetitive. That makes it easy to lower (when announcing the next couple) then crank back up again. 3. Recessionals: I always feel that Recessionals should be fun, without going too far off the grid. But a song whose opening lyric is “Your love keeps lifting me higher, than I’ve ever been lifted before” is a no-brainer. 4. First Dance: The lyrics and the song’s beat are so uplifting that this is a perfect first dance for brides and grooms who are willing to have a little fun with their special “first” song as a married couple.